Head to historical Custer and stay in the woods, just off the golf course. This cabin is comfortable with plenty of sleeping areas and 2 1/2 bathrooms. The main floor offers two bedrooms, one with a queen bed, one with a full sized bed, and a full bathroom. There is also a queen sleeper sofa in the living room. The downstairs finished basement has a full sized bed, laundry facilities, and a half bathroom. The upstairs master bedroom has a king sized bed and full bathroom. There is also a loft with a twin bed separate from the master bedroom. Though this home is beautiful inside, you'll want to spend most of your time outside. Enjoy the 2 covered porches or relax in the 6 person hot tub. Want to sit around a fire in the evenings? No problem, with this beautiful fire pit and log furniture, you'll never want to leave. There are picnic tables as well as a gazebo overlooking the pond with gorgeous sunset views. Set back from the road and town but close enough for easy grocery runs. Bordering the golf course, this 9 acre lot allows time and space for hiking and golfing. The moment you walk in this place, it feels like home. Together with my family, we enjoyed every last minute of staying here. It was a great privilege for us and we hope to see you soon and be back next year! This home is the one you dream of when you are planning your Black Hills vacation. We couldn't have been happier! 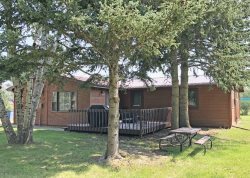 It feels secluded in the woods but is only minutes to downtown Custer. As a beautiful cabin with a hot tub and fire pit, it was just what we needed to come back to after a day of sightseeing. Thank you for making our vacation unforgettable. We will be back!